Emotional/Spiritual Benefits: This is the stone of love and relationships. If you need more love, want to be more loving, or want to bring more love into a relationship-this is the stone for you. 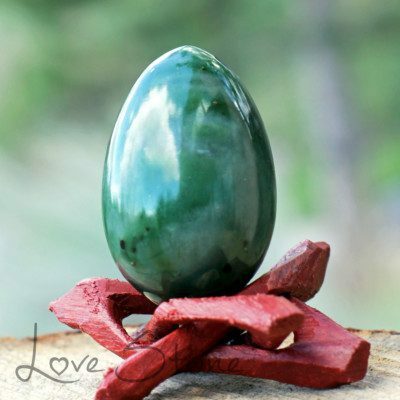 Physical Benefits: Some of our Yoni Egg users have said these eggs have provided physical benefits such as aiding in circulation, skin problems, headaches, fertility, and female reproductive system. These benefits are NOT CONSIDERED MEDICALLY PROVEN by Love Stone Ltd.
Each stone is unique in appearance as every one of us. Because all of our yoni eggs are cut from 100% natural stone, there is always color variation. Actual yoni egg you received might not look exactly the same as the one shown in the pictures above. All Yoni Eggs are made from grade A Rose Quartz and are quality inspected before they are shipped. We only stock quality gems suitable for internal use.